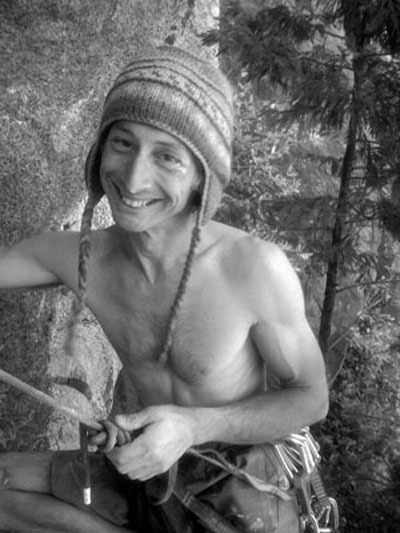 Verdon based Climbing Guide and Pedagogue Alan Carne learned the craft of traditional Rockclimbing in his formative years on the Gritstone outcrops of the Peak District in his native UK. Born in the City of Salford, and vicariously proud of having gone to the same high school as Don "The Villain" Whillans himself, an early youthful wanderlust took him cycling and hitch-hiking out of the inner city to the nearby moorland wilderness. This period (late 70s to early 80s) witnessed an awakening of young and talented rock athletes centred on the limestone village of Stoney Middleton in the Peak District and Alan became part of this tightly knit band of British "Stonemasters" which he considers inspirational mentors, and included some of the legends, ( both sung and unsung) of the sport; Jerry Moffat, Ron Fawcett, Johnny Woodward, Derek Hersey, Nick Colton, Al Rouse, Mark"Zippy Pretty", Dougie Hall... and many others. This appetite for travel soon took him in 1979 to France's Verdon Gorge. A mysterious Canyon in the heart of Provence and at that time just starting to emerge as the forcing ground for the development of big wall adventure sportclimbing. It was the start of a lasting and ongoing love affair with this part of France, and since 2005 he has been a permanent resident. Boundlessly motivated and always keen to inspire, he is a distinctive feature of the indigenous climbing community in the area. When not running it out on the beautiful grey walls of the Verdon, Alan is likely to be entwined in his parallel passion the Guitar, which he feels has many elements in common with climbing; analysis and perfection of movement, 100% focus, and the discipline of practice. 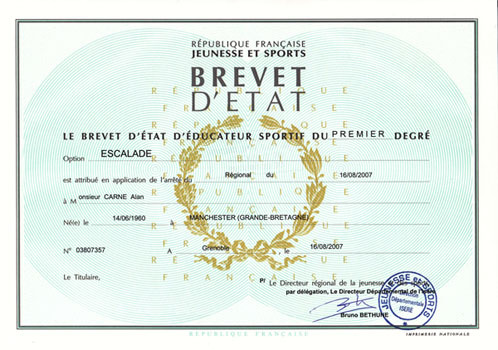 The brevet d'état (national diploma) and the mountain guide certification are the only two qualifications allowing a guide to work legally in France. The difference between the two is one of specialisation. The BE escalade is a rock climbing specialist and coach, and must climb to a high level themselves. The mountain guide, on the other hand, is an all-round ice, rock, and ski mountaineer. The entrance test for the BE escalade programme is by a climbing competition (minimum three 7a routes on sight) and interview based on presentation of an extensive list of experience.The programme itself includes modules in trad. climbing and advanced ropework, physiology and anatomy, training, teaching skills, and canyoning. After a period of approved guiding experience, the final exam consists of written, oral, and practical assessments.There is also a requirement for regular skill updating. A growing CV and a reflection of Alan's climbing experience. Several visits to the Sandstone mecca of Wadi Rum. Extensive Experience of over 150 routes in the Verdon. Hampi, Badami and several areas around Bangalore. Climbing and equipping new routes with local Indian climbers.